Like the original, H3000 Factory is a modular algorithm allowing you to create completely custom effects that can be manipulated in real time and even synchronized to the session. Combine up to 18 effects blocks together in unique ways to get a virtually limitless array of sounds. It offers pairs of audio effects blocks including sweeping delays, pitch shifters, amplitude modulators, filters plus a noise generator. An assortment of modulation sources include two low frequency oscillators, envelope generators, mixers and more. 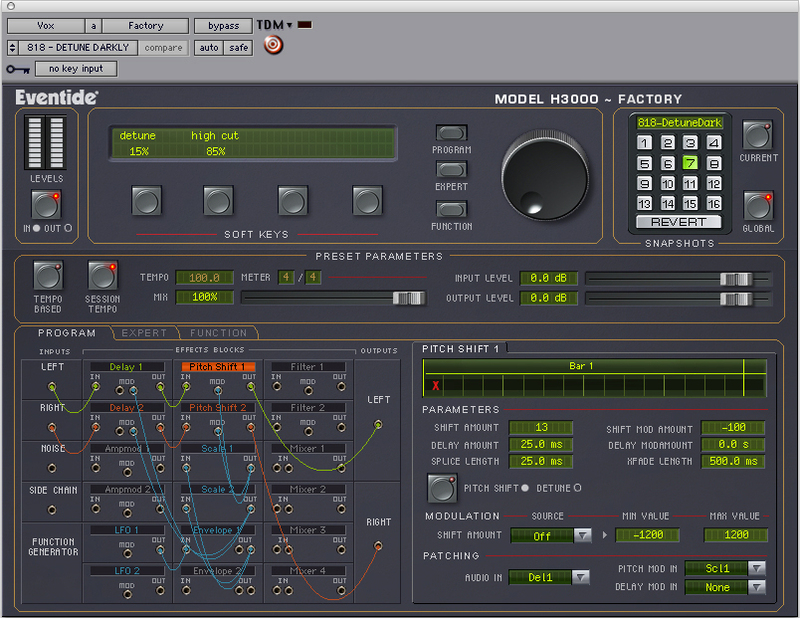 Even the original Parameter Modulation features of the H3000 are included as well allowing you to create the uniquely dynamic programs that made the original so popular. As with all Eventide plug-ins, the convenient Snapshots allow for instant program loading of up to 32 different presets within a single session. All of this, with the sought-after sound of the H3000, brings you a great-sounding plug-in that’s as easy to use as the original that inspired it. 18 effects blocks can be wired “anything to anything” for limitless creations. Delays utilize our intuitive Beat Grid, letting you easily place delays in perfect time with the music. Fully adjustable filters offer Band Pass, High Pass, Low Pass and Shelving types with Q factors up to 100. Over 200 parameters make this an incredibly versatile sound design tool. Drag and drop re-ordering of effects blocks. Full MIDI implementation offers loading of preset Snapshots and MIDI controller support for Parameter Modulation. Parameter Modulation with a host of Function Generator abilities for incredibly dynamic sound shaping. Master “Global” controls affect all similar parameters. Soft Keys let you customize the preset parameters. Familiar interface is easy to use. The H3000 Factory is compatible with TDM ProTools systems only on the following platforms.